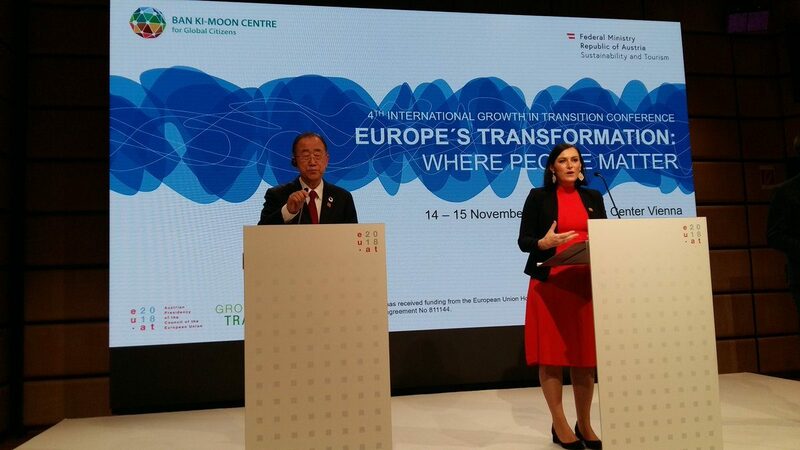 The Austrian Federal Ministry for Sustainability and Tourism (BMNT) and the Ban Ki-moon Centre for Global Citizens hosted an opening discussion at the Growth In Transition Conference on Wednesday, 14 November 2018. Elisabeth KÖSTINGER, Federal Minister for Sustainability and Tourism, Austria, and Ban KI-MOON, former Secretary-General of the United Nations and Co-Chairman of the Ban Ki-moon Centre for Global Citizens, focused their statements on the implementation of the Sustainable Development Goals (SDGs) and the Paris Climate Agreement. Köstinger began by stressing that there must be no either/or when it comes to the economy and sustainability. The topic of sustainability, above all climate change, is a highly explosive one for the Minister, which calls for concrete action. As part of the Austrian Council Presidency, she is therefore keen to bring the climate conference in Katowice in December to a successful conclusion. “I believe that there is no greater challenge for our generation and our century than tackling climate change.” She mentioned the climate package, CO2 emission reduction, the ban on plastics and environmental pollution as the most urgent issues currently under development. To this end, the Austrian government intends to strengthen its joint commitment in order to make progress in the implementation of the SDGs. “We are in 9th place in the implementation of the SDGs and our goal is to be among the top 5”, says Köstinger. This of course requires even more commitment, including for instance room for improvement in agriculture. She also mentioned the “massive fight against climate change” that is yet to be won. There is also potential for improvement in the area of sustainable consumption and lifestyles. A massive effort on the part of everyone is needed, says Köstinger. “This vision of an oil-free society is a vision that I absolutely want to realize.” A tax reform will be introduced in 2020 in order to harness potentials and steering effects, including the introduction of a carbon price floor. She expects resistance and is still looking for allies to advance the vision. The building renovation rate is also to be raised to 2%. The Minister is in very intensive talks with the federal states. “We want to create an unprecedented incentive system so the vision can progress rapidly. But the crucial thing is that we will only succeed if we bring about a movement where each individual citizen understands that this is to their own advantage. We still have a long way to go. We still have a lot to convincing to do, that is our main task”. Köstinger concluded with an appeal to journalists and the media’s responsibility to present climate protection in a way that highlights it as a huge opportunity for everyone. Ban Ki-moon also confirmed in his statement the importance of the implementation of the 17 SDGs. He voiced concern about increasing nationalism and protectionism, while calling on all world leaders to implement the SDGs “for a global leadership, global citizenship for global solutions.” This could lead to “common prosperity for all”, even in the poorest countries in Africa. The nationalist outlook of many leaders and the SDGs could not work together. Especially the empowerment of women and young people is close to his heart as part of the Ban Ki-moon Centre for Global Citizens, so that they can assume this responsibility. “Leaders don’t know how to walk in the shoes of others.” His centre is to be a role model in that regard.